I had another nice breakfast today - scrambled eggs with sauteed leeks - and a side of arugula. I'll tell ya - butter and eggs - How can you beat that. Yum yuuuuuuum. Then I came home for lunch and my girls had two new eggs for me in their pen. Hmmmm, what to make? Well, I had some left-over rice in the fridge that I cooked a few days ago. It was a bit stiff since it has been in the fridge. But you know what that's great for? Yeah, you know it. 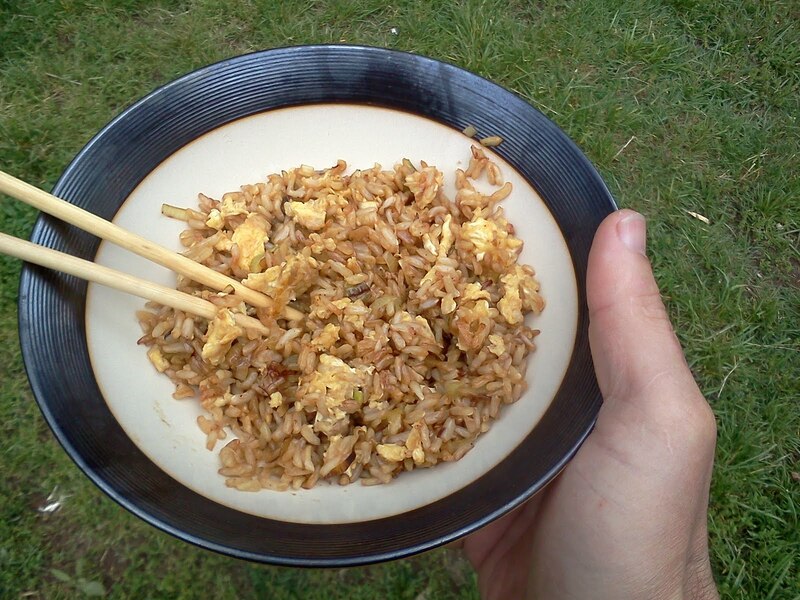 . . fried rice! I chopped up some leak and sauteed it again in some butter. I threw in the rice when the leak was done and I crisped it all up together. Then I cracked an egg in the middle of the pan and scrambled it until it was cooked, chopped it up and mixed it in with the Fri Ri. And it was goooooooood! Well wouldn't you know it - it's pouring rain again! I hope those chickens are ok. I did get them an umbrella so they should be fine. Their permanent shelter is almost finished. I'll take some photos of that later. If the rain lets up for 10 minutes I'll throw those fish pieces on the grill. This weather has really thrown me some curve balls. I've frequently had to adapt and change my plans and ideas. It makes for an interesting Survivor Diet. But I'm still going strong with just one week to go.